Welcome to 'Cottage by the Sea'---an ideal place for rest, relaxation and romance. Imagine a place that feels so far off the beaten path you can still feel the spirit of 'Old Hawaii' gracing the rooms of this special Waimanalo gem. It is simple yet perfect, complete with all the details that make a place truly comfortable and homey. The cottage is decorated with many personal touches, tropical and artistic with its own unique feeling. Walk up a beautiful stone pathway; edged with colorful plants, tall palms, and banana trees, to enter into this very private enchanted domain. The sun dappled porch calls to you, strewn with the fushia and purple petals of the bouganvillas that frame it, a symphony of birds singing their welcome. Feel the sense of peace, of coming to your home away from home. A two minute walk down the road will take you to one of the most beautiful beaches in Hawaii. Sunrise is spectacular. Enjoy a cup of coffee and watch the show! A cool and romantic bedroom features a queen size bed with ceiling fan, and beautiful island art to create a sensual and very Hawaiian type of ambiance. Guests repeatedly tell me how at home they feel here, with the cozy atmosphere and attention to detail so evident. The cottage is nestled in a tropical garden filled with banana and papaya trees, colorful flowers and the fragrant aroma of plumerias floating on the ocean breeze. Birdsong and the sound of the ocean surf fill the garden with its own special music. The location is ideal, in a residential country setting and only two houses from one of the most beautiful beaches on the island (in 2015 Dr. Beach named it one of the best beaches in the U.S.----in 2003 National Geographic named it one of the most beautiful beaches in the world!). The beach is totally undeveloped, just miles of undisturbed beauty with the stunning grandeur of the Ko'olau Mountains hugging the coastline in a spectacular embrace. All this is only a two minute walk from the cottage! In the back there is a very private yard lush with tropical plants. The backyard has a propane barbecue grill with a dining table and a couple of lounge chairs by the little water fall, perfect for star gazing at night or lounging under the endless summer sun. Welcome to a little piece of paradise. Restore your spirit and feel the peace within. Let the sound of the waves caress you to sleep at night and embrace the morning with another perfect day at the beach. Just a two minute walk from one of the most gorgeous beaches in Hawaii! Close enough to hear the sound of the waves from the bedroom at night. Right next to a beautiful, mostly empty beach. The host Skye is so nice and helpful. The house is nice and has a beautiful tropical garden. We had a lovely time at Skye's Waimanalo Cottage. Cozy and comfortable, with such great access to an amazing and uncrowded beach. Enjoyed all the outdoor seating and the beach chairs and umbrella. Well-stocked kitchen and we were easily able to cook some meals for our family. Beautiful, quiet, romantic and unpopulated beach! After a very long flight from Montreal we finally arrived at this beautiful cottage where Skye was welcoming us with a very warm "Aloha"! A word that we kept hearing from all the friendly locals in the area. Since we arrived late and tired we didn't have the chance to get some food and Skye was very quick to offer us some essentials to keep us going until the next morning. Mahalo, Skye! 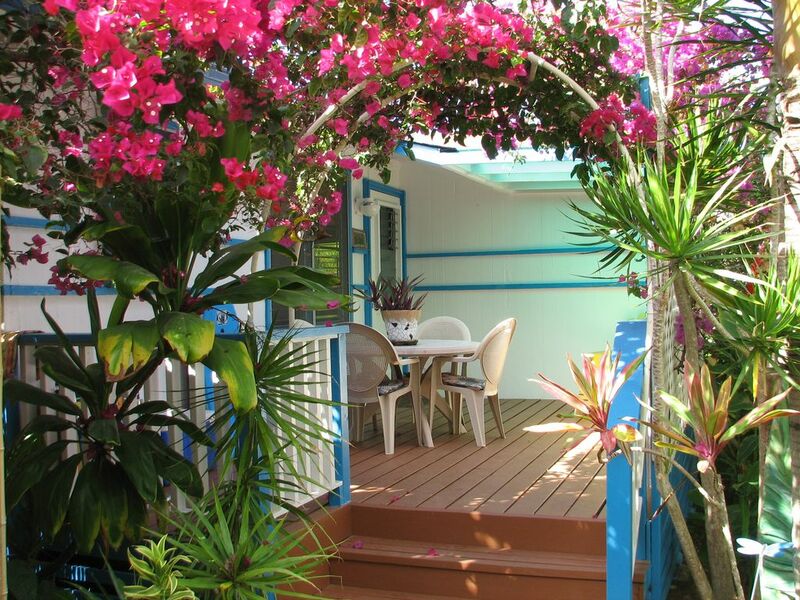 The cottage is a quiet and very clean place surrounded by beautiful tropical flowers. The decor is very homey and Hawaiian. It makes you feel very welcome. We loved having breakfast and dinner at the front porch. Even though there are 2 other rental apartments at the property it always felt very private and secluded. The location of the cottage is perfect. The most beautiful beach is just a 2 minute walk away and touring the island is so easy from this location. There is an amazing little vegan restaurant in walking distance, which we just couldn't get enough of. We really enjoyed our stay and hope that we can come again soon and stay at the cottage. Being one block from the beach was awesome. Very windy with high surf during our stay, but still very much enjoyed our time here. Kitchen was a bit small to do a lot of cooking, but other than that we really enjoyed the serenity of the cabin. While planning our honeymoon to Oahu, we had many friends provide recommendations based off of their previous experiences --one tip that we heard consistently was not to stay in Waikiki. Considering the vast majority of hotels on the island are on Waikiki, we wavered back and forth on where to stay and whether or not a vacation rental was the right fit for us. We eventually settled on booking the “Cottage by the Sea,” and were very pleased with our time here. Skye was an incredible hostess, she gave us plenty of privacy but was there whenever we needed her; she was responsive, helpful with questions, and took the time to provide specialized recommendations. As for the cottage itself, set your expectations accordingly and do not expect to live luxuriously while here. The cottage is in a safe, clean middle class neighborhood with a private walkway to one of the most beautiful beaches I’ve ever stepped foot on. Although dated, the cottage is well loved and very clean (though there were a few spots in the shower’s grout that could’ve used a bit of bleach). The decor is kitschy, with plenty of mermaids and hula girls, and the private garden out back was perfect for meditating or relaxing. All in all, we were very pleased with Skye’s cottage, and would stay here again on a future trip to Waimanalo. There were plenty of great restaurants and things to do in the neighboring towns, and all of the tourist attractions were only 30 minutes - to an hour away. We loved our stay at the cottage. Cozy and comfortable. Beautiful established plants all around the cottage provide privacy. Skye provided everything we needed in the home and beach chairs, boogie boards and a cooler for beach use. There's a very private back yard with table and chairs and BBQ grill. Laundry facility is available. It's a very short walk to the beautiful pristine beach which felt private because it's a residential area, not many people on it. There's great food in walking distance (loved Ono's Steak and Shrimp Shack!). Next time we plan a trip to Oahu, we will definitely book the cottage again. Aloha for your kindness Skye! Great hiking available in the area with diversity of scenery and skill level. Fabulous beach, with many water sports; kayaking, wind surfing, boogie boarding, snorkeling, etc. Well known area for hang gliding and parasailing. 3 beautiful Golf Courses within a 15 minute drive of the cottage. Local Art Gallery and Local Style Restaurants right in Waimanalo. Hike to the famous Waimanalo Lighthouse where on a clear day you can see the outer Islands. In the winter whales pass right along the coast, easily seen from the Lighthouse. Hike through tropical rainforest to cascading waterfall and pool. Sea Life Park is 5 minutes from cottage. Rodeo and many equestrian sports.